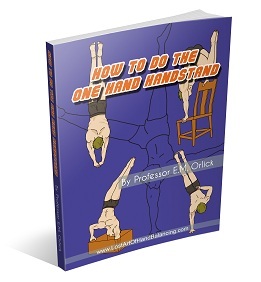 The following is excerpted from the True Art and Science of Hand Balancing about Professor Paulinetti. “Early in November, 1920, the word was passed about in the city of Calcutta, India, that an event of interest would happen at noon of a certain day atop the dome of the Empire Theatre Building. Their curiosity aroused, and spurred on by the fact that they would see something free of charge, the natives thronged about the square where stood the popular playhouse. Promptly at midday a figure appeared as if from nowhere, arising from behind the ball atop the dome of the building. Seemingly he grasped the smooth sides of the sphere, leaned forward and placed his head on the top of it, and slowly pressed up into a perfect balance on the head, the hands being held on the hips, and the legs spread apart and inclined forward. There, clad in blue tights that made him visible for considerable distance, the performer remained at least thirty seconds–to the watchers below it seemed an hour–then, just as slowly as he arose to balance, he lowered his body and disappeared from view behind the dome by way of the same ladder by which he had ascended, while on the packed streets below the crowd roared its approval. Amazing what a simple looking (but not so simple in execution) trick can do to the minds of others, isn’t it? But this was a run-of-the-mill activity for the Professor, not even close to one of his more difficult performances. If you are interested in hearing more stories about Prof. Paulinetti let me know. Hearing, reading about, or seeing the best can always give you some extra motivation.